the total scene: Chicago dance company Ishti examines divided country in new production, "Prakriti: A History of the Present"
Chicago dance company Ishti examines divided country in new production, "Prakriti: A History of the Present"
In its latest production, "Prakriti: A History of the Present," Chicago dance company Ishti examines how divided the county has become in the wake of the 2016 presidential election. Creating productions that are both relevant and accessible is part of Ishti's mission. 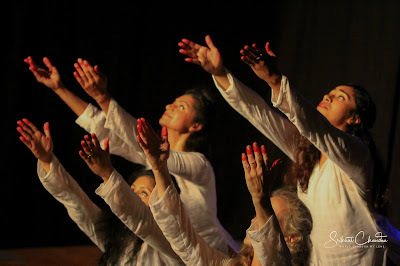 “Prakriti: A History of the Present” will be performed at 7:30 p.m. Sept. 28 and at 3:30 p.m. and 7:30 p.m. Sept. 29 at Indian Boundary Park, 2500 W. Lunt Ave in Chicago. General admission tickets are $20 and student tickets are $15. I had the chance to talk to choreographer Preeti Veerlapati about the production. Q – How were you inspired to create this production? Is the production coming together as you envisioned? After the 2016 election, we witnessed just how divided the country had become. People could no longer communicate with each other without letting their emotions take over to the point that friends and family members would no longer talk to each other. Kinnari’s good friend and his twin sister stopped talking to each other because of this and that is what inspired us to create this production. How have we, as humans, have arrived to our present-day climate? How and why can we be so unwilling to listen to views, beliefs or behaviors that are different from our own? We journey to our most primitive/primal times to discover our need for tribes, reactions to the different and ability to find balance. The production in pretty close to what we had envisioned conceptually. Due to some technical challenges, limitations with the space, budget and man-power, we are learning to find a balance between our dreams and reality. Q – The production will also feature an original score and live music by composer Bob Garrett, visual art by filmmaker Shawn Convey and light design by Geoffrey Bushor. How did you come to collaborate with them? Do you all share the same ideas for the production? We have been very lucky to collaborate with some super talented, like-minded artists who believe in our work and have inspired us all along. At the time of conception, we had envisioned a music mix with rare instruments: ancient (yay bahar, Tibetan glass singing bowls, Indian mouth harp), Indian classical and folk music, ancient chanting as well some new age electronic. Considering all this, composer, sound designer Bob Garrett was an obvious choice. Once the story board was shared, Bob came up with the original score almost as if it were a painting, landing the score a visual appeal. The honesty, emotional depth and healing qualities of Shawn Convey’s work has always appealed to us. We learned more about his process of filmmaking, his beliefs and our shared ideas after our work in progress. We absolutely enjoyed our collaboration with Shawn, his encouragement of our silliest ideas and his enthusiasm for the project. Geoffrey Bushor’s experience, creativity and willingness to work in a nonconventional space and with unconventional lighting had shaped our very first production. When we approached him with Prakriti, he came up with a map of the 1800s and the history of the performance venue, Indian Boundary Park, and so started the detailing and finishing of the project. Q – What are the different dance forms that will be part of the production? The production is influenced by various dance styles. Most of the choreography has been about creating a new vocabulary influenced by traditional and modern dance forms. It is rooted in Bharatanatyam – a South Indian classical dance form – along with various forms of Indian folk dance styles. Kalaripayattu – a martial arts form from India, also is represented, as well as modern and contemporary dance. You may also see the influence of Performance Art and Theater. Q – Is this production more challenging than other productions Ishti has done? How does the production fit in with Ishti's mission? Absolutely. The abstract nature of the subject and the in-depth research and thought put in for each movement, each moment and the intensity of emotions without a physical story was new for us. The number of dancers, the diversity in their dance training and backgrounds have been a gift and challenge at the same time. Use of Solkattus (vocalization of percussive syllabus in South Indian music), chanting a shloka (verse from ancient Vedic meter in Sanskrit), wearing non-traditional costumes, conceptualizing the dance first (with the music composed after) are all unique to "Prakriti." Q – What would you like the audience to take away from this production? We believe that it will open up a dialogue: sensory, emotional and cerebral. However, the takeaway message is left to the audience. It may be a life-changing for some, it may be an evening of pleasing visual aesthetics, unique music and atmosphere for others. We do not intend to impose our ideas on anyone – there is no right or wrong. Each of our performances end with a talk back and a chance to share the process, ideas, etc.